SofTutor will change your impression of E-Learning & IT Training Forever! It reduces training and support costs, while increasing retention. Try this free Microsoft Excel 2007 / 2010 Data Mining Tutorial and see for yourself. March 31, 2010 - PRLog -- New Vision Software, Incorporated (NVSI), Barrington, IL - announces the availability of the free SofTutor for Excel 2007 Demo. SofTutor reduces learning time on data mining and data manipulation in Excel by up to 70 percent with its easy to use search and display functions. In addition, learners can consult specific “how to” information without leaving Excel using SofTutor’s unique, resizable overlay window. With 15 specific topics, learners quickly become skilled at importing from a table from a web page, separating fields, formatting, sorting, removing duplicates, filtering data and exporting. Originally NVSI created this demo in about two hours (idea to delivery) with the new SofTutor Learning System rapid development tools to show how quickly content could be created. You'll learn these data manipulation techniques in about 25 minutes. Then to highlight SofTutor's quick technical support features, the demo was indexed so users could find specific topics hidden within the 13 minute video and learn them within seconds. SofTutor saves time and money by reducing the time it takes to make training, the time it takes to learn and the time it takes to find information. Unlike typical elearning products that reproduce the classroom training environment online, SofTutor reproduces instruction to provide a one-on-one training experience. "Our goal was simple. We wanted to reduce the time it takes to learn, increase retention and make learning fun! ", says founder Randy Hilgers. Typical elearning teaches in three steps: 1) Lecture, 2) Remember, 3) Try or be Tested Later. SofTutor teaches in one step: 1) Try it Now! Elearning products lecture or "tell you what to do". 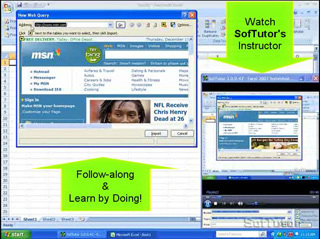 SofTutor "shows you what to do" and allows you to follow along with the instruction. SofTutor uses a performance based learning technology which reduces the learning time, increases retention and engages the learner in the learning process, which makes learning more enjoyable. Corporate or Educational SofTutor Learning System users with authoring tools can update, modify or add this training to their network. SofTutor Learning System with Authoring tools is available today for Corporate Licenses starting at $899 and Academic Licenses starting at $499. If you or your organization want to make training for resales, please inquire about our professional licenses. New Vision Software also offers a full range of professional services to assist you in your training needs, to help with video production or to deliver a custom shrink wrapped product. New Vision Software, Incorporated, revolutionizes software training by combining overlaid hands-on video learning with easy to follow examples. Since 1995, over 250,000 users — from major universities to Fortune 500 companies to those learning at home — have reduced their learning time by at least 50 percent while increasing their retention of the material. Customer satisfaction has remained at 99.976 percent since 1995. With the new SofTutor Learning System, subject matter experts can create customized training programs with their own content while users can find and display specific training information without leaving their current application. For more information, please visit http://www.nvsi.com. SofTutor is a registered trademark of New Vision Software, Incorporated. Excel is a registered trademark of Microsoft Corporation. Pricing is subject to change at any time without notice. All pricing is in US dollars. SofTutor learning products for LAN, intranet, web & stand alone are the Fastest Way to Learn, Teach, Collaborate and support others; 100% Follow Along, Learn by Doing is Fast, Easy & Fun. Preferred Over Classroom, elearning, and Web Based Video Training.